Looking for a great tennis camp full of fun for your kids? Sign them up for one (or more) of our tennis camps during the school holidays. Your child will receive top class tennis training by our enthusiastic professional tennis trainers. They’ll make sure your child has a tennis camp he or she won’t soon forget. Each day will consist of at least 4 hours of tennis training combined with other fun activities like laser gaming, squash or bowling. Sign up for a great tennis camp full of tennis fun! Please note that the sample program is for a 5-day tennis camp. The graphic below serves merely as an example of what the planning could look like. € 375,- per person per camp for a 5-day tennis camp. From what age can children join your the Amstelpark tennis camps? Our youngest participants are generally 4-5 years old. Does our child need to have any experience with tennis if he/she want to join? No experience is needed. Complete beginners are more than welcome to join. Can our child be in the same group as his/her friend(s)? 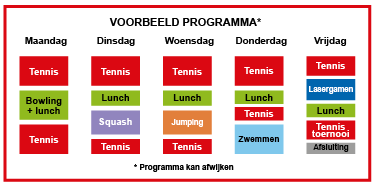 The groups during tennis camp are put together based on age and level. As long as there isn't too big a difference in either, we will try our best to put them in the same group. We will however not sacrifice the homogeneity of the group for the sake of kids being together. There are more than enough moments during each camp where all kids get together.